Geneva Deck Outdoor Kitchens exemplify luxury in all aspects of outdoor living, from the designer powder-coated finishes, to the exclusive door styles. To complement these top-of-the-line outdoor cabinets, various products are offered to enhance the quality of your outdoor living space and help you continue your indoor style to the outdoors. No matter the luxury item you choose, your outdoor living oasis is sure to be the most comfortable and stylish in your neighborhood. Entertaining outdoors can be as simple or as elegant as you want it to be. That’s because Geneva Deck has everything you need to transform your outdoor space into a fully functioning entertainment center. 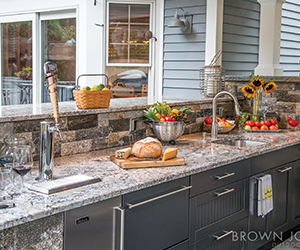 Choose from a variety of kitchen cabinets, grills, refrigerators, sinks and faucets, ice makers, coolers and freezers, and bar tending stations to create your favorite place to celebrate, relax, and enjoy.